﻿﻿First of two prototypes created from modified warbirds. Controlled remotely via telepresence. Carried adaptable triphasic weapons systems. Special skill(s): May report at any spaceline location. 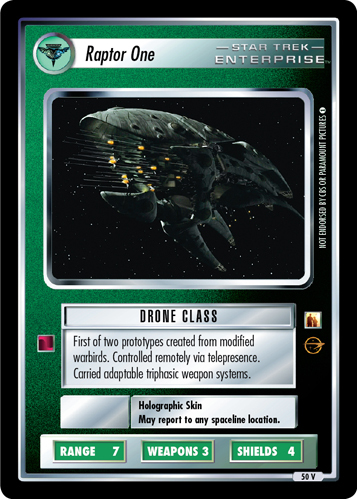 Characteristics: affiliation, 22nd Century , Drone-class, Romulan ship, "prototype" ship.